Yesterday, the video game industry as a whole was turned upside down following the announcement of Satoru Iwata's passing over the weekend. 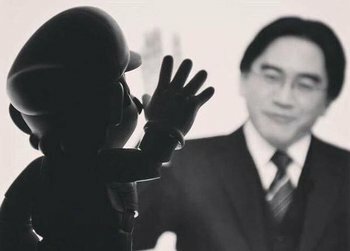 Iwata-san, Nintendo's fourth President, was known for his love of games, his dedication to his company, his adoration of his fans, and not least of all, his laugh. Many friends, fans, and admirers have shared their feelings on the sudden loss of one of the most inspirational leaders ever seen in video games. In a statement obtained by IGN, Shigeru Miyamoto said "I am surprised at this sudden news and overcome with sadness. The entire development team at Nintendo will remain committed to our development policy which Mr. Iwata and we have been constructing together and to yield the development results which Mr. Iwata would appreciate." Flags from Nintendo's Headquarters to the Mushroom Kingdom are being flown at half-mast, and the official Nintendo Twitter accounts have announced that they will be taking a day of silence in honor of his memory. Here are some of the beautiful tributes to Satoru Iwata. Warning: you will feel feelings.